Property Size 1,680 sq. 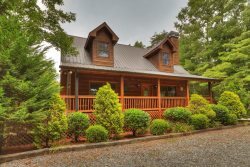 ft.
A comfortable cabin in a peaceful, relatively secluded wooded setting. Perfect for a romantic getaway but able to accommodate a whole family. Enjoy nearby shopping and restaurants or take a short drive to Harrah's Cherokee Valley Casino. Furnished to provide everything you need to relax. Outdoor hot tub to soak away life's stresses, screened porch with swing and rocking chairs to enjoy the mountain air .A garden tub in the master suite is perfect for bubbles and wine. The cabin also has a regulation size pool table and with a ping pong table for family fun.